Finally! 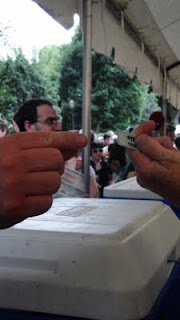 I was fast enough to secure a volunteer spot at one of Portland’s many Brewfests! I got signed up for a Friday night shift at Portland’s International Beer Festival (It also made a stop a few weeks earlier in the Emerald City) -- I just had to do it a few months in advance. So here’s the behind the scene look. We all arrived at our shift and sort of gathered like cattle outside the fence as a guy wearing a ‘Beer Police’ T-shirt -- and by that I mean it was a Int’l Beer Fest shirt that he’d taken a sharpie to, writing the phrase on the back -- filled us in on the rules. Once we’d gotten the instructions we filed in, signed paperwork, got our non-drinking wristband and our station assignments. I was assigned to booth number 12 so I was over in the Northwest corner of the park block hosting the event. I walked up and the first shifter was eager to tell me how lucky I was and how great the beer that I got to pour was. He made sure to point out that when he got his volunteer tickets he’d be back for some tastes -- which he was. I was pouring two different beers both Belgium's from the same distributor (Shelton Brothers) and both cost three tickets -- or around $3.00 for each 4 ounce pour. 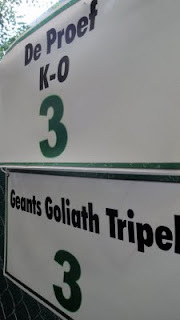 The first one was Geants Goliath Tripel. I was saying “trip-pell” but as one customer pointed out, with his nose in the air, it’s “tri-pull.” After researching on the world wide web -- it sounds like most people, even those in Belgium -- say “triple.” Feel free to let me know if you know something I don’t and if you know that snobby guy -- please laugh at him. Anyway, that Goliath (said Gouyasse in the local dialect) is a 9.0% ABV with a low number of International Bitterness Units at 25. I only managed a small taste at the beginning of my shift, thanks random guy who let me borrow your tasting glass -- my only criticism of the volunteer shift* -- but through that taste and a few other comments I’d recommend this beer. It has some hints of citrus, is very smooth and would be very kind to a newbie beer taster’s palate. You can taste the hops and plenty of malt, because that’s all that’s used with this beer, no sugars are added. This means that the longer the beer sits -- the drier it will get because the malt starts to do it’s work -- but if it’s a newer batch it will be sweeter. My other beer wasn’t that different when compared side to side. It was De Proef K-O. This one a Belgium Blonde Ale. It’s name is really there because it can knock you on your behind if you aren’t careful. It’s sweet and light and crisp and 10% ABV. You like the label? It was something that was found in our area up at Pike Place Market. It came from a defunct apple orchard but was revamped into what you see. K-O also is on the low end of the IBU scale coming in at 25 as well. Once I had my beers it was time to pour, and I did, occasionally. The three ticket sale detoured many people but I had some regulars, a few I was able to persuade to try it (I feel a sales career coming on) and at the end of my shift before taps closed I had a number of people use up their tickets to try to get their drunk on with my high ABV beers. Overall a very fun experience though if you do it I suggest trying to sign up with a friend. I chatted with the folks next to me and the customers but a friend would be fun. I also sadly didn’t plan and had too much going on during the weekend so I wasn’t able to go back and use the free tickets I earned for volunteering -- I hope the random couple on the street on Sunday afternoon had a taste for me though. Did you know that Belgium is referred to as The City of Giants? *For volunteering at the Fest we each got a free cup, T-shirt and 10 free tasting tickets -- but we didn’t get it until after our shift and we had no opportunity to taste the beer we were pouring before we started offering it up to people -- making it tough to answer people when they asked what it tasted like. My suggestion for improvement would be to offer tastings and/or more information about the beers to each volunteer. Grab some wine, College Football Season is here!